practice bombs weighed 100 pounds each and contained four pounds of powder – the rest was sand. Several locations across town display the remains of these bombs. The first bomb dropped through the roof of a frame garage owned by F.F. Bourk northwest of the courthouse and only 39 feet from an apartment complex where several families were sleeping. The concussion of the bomb tore through the roof and floor and blasted a crater about 20 by 40 inches. In a few minutes, the plane appeared again dropping another bomb which grazed the west wall of the old First Baptist Church – about 100 feet from the first hit, tearing a hole in the earth about 30 inches in diameter and about 48 inches deep. The third bomb hit the sidewalk about 200 feet north of the courthouse, making a crater about the size of the first. The fourth bomb struck the ground a few feet from a fuel transport truck. The driver lit out immediately and has probably never been back since. 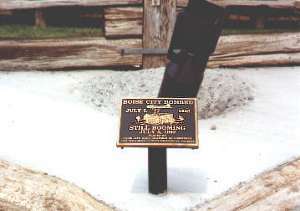 The fifth bomb struck the ground 80 feet from a local home and the sixth bomb fell far from any buildings on the southeast of town. At this time an electric company employee turned off the electricity and put the city into darkness. About this time a soldier visiting from the base called the proper authorities at the base to inform them of what was happening. The next day, officials from the Dalhart Army Air Base visited Boise City and explained that the plane had been assigned to drop bombs on a range near Conlen, Texas, about 30 miles south of Boise City, but somehow got off their mark and mistook the four street lights around the courthouse in the center of town for the lights of their target. For Rent: 2 bedroom house fully furnished. Contact Bill or Jan Terry 580-544-2293.